According to a Sina poll, these are the top 10 movies that people are looking forward to, which like I said, should be taken with a grain of salt, especially considering a movie that doesn’t even have a poster is in the top 3. I think people just saw the name and clicked. The results are probably also going to be in a state of flux. There were fifteen actually on the poll but I left out the last five because either 1) Like, Cape No. 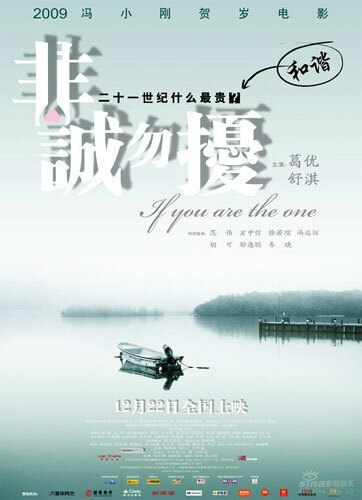 7 it had already been out for a while in other regions, so people probably already saw it through illegal means and 2) I don’t care (Sorry Wu Jing…I’m sure your directoral debut is awesome, but not my thing). Ten’s a good number. 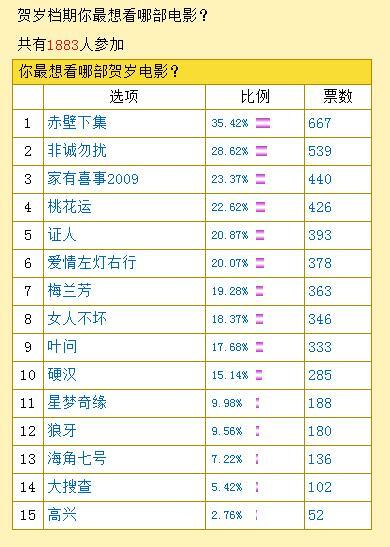 These are the numbers from Sina if you want to know. And on to the movies…! Appeal: Liu Ye, arguably China’s best actor of his generation, added on 40 pounds of musle to play a violent version of Forest Gump in this movie. Added in the mix is Anthony Wong as the villain, and Hu Jun and one of my favorite actors Sun Honglei round out the cast to make it promising. 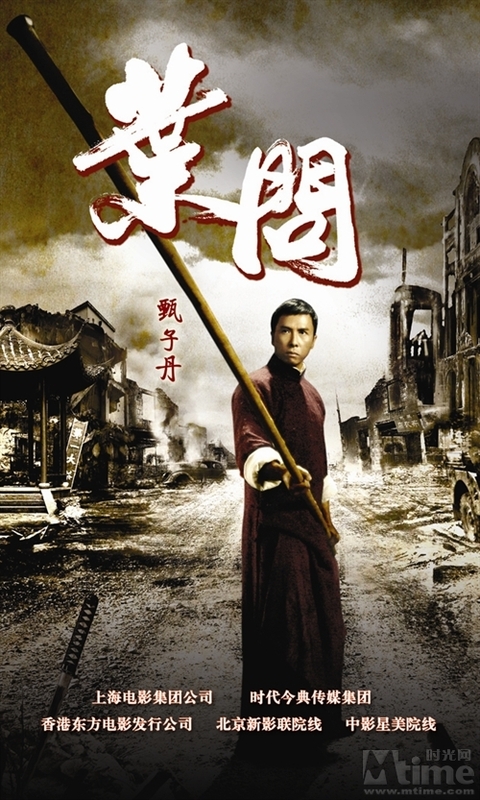 Appeal: Donnie Yen being kickass as the teacher of Bruce Lee, Ip Man. I don’t know how appealing that is for the girls, but I can see the guys salivating already at the thought of this. From the trailer it looks every old school. Appeal: I thought this would be higher actually on SINA’s poll. Famed director Tsui Hark hasn’t given us anything really decent in recent years but maybe this could be it. It was supposed to be released in October, but it was pushed back towards the end of the holiday season because it was supposedly better than distributors expected. Given the looks of the trailer it seems reminicent of the older comedies of Hong Kong that were so good and that’s probably why this is my most anticipated movie for the holiday season. Also the cast is fantastic. There’s Zhou Xun, Guey Lun-mei and Kitty Zhang Yuqi in the lead roles. I don’t think the first two have ever disappointed me with their acting, and as for Zhang Yuqi, I think she’ll fit her role well. The male side boasts Alex Fong (who’s apparently hot now after starring in the popular Hunan TV series Dream Links), Stephen Fung, Eddie Peng (in glasses! for that reason alone I’d go) and a couple of other actors you may not know but are definitely eye-candy like Qi Ji. Appeal: It’s China’s big artsy film of the year and possible redemption for Chen Kaige after his previous disaster The Promise. This should be better considering that the material more up his alley and that most directors bombed big when trying to tackle wuxia epics, but who knows? It stars Leon Lai and Zhang Ziyi, but no Gillian Cheung. Too bad because this could have been billed as “the first appearance of Gillian since the scandal” although that’s probably not what directors would like their movie to be known for. Appeal: 12 guys and 1 girl. Romance movie. Should draw all the women I’m sure when those guys include Huang Xiaoming, Lu Yi, Nie Yuan Alec Su, and Zhang Junning. Zhang Junning!!! Something magical apparently happens to Karena Lam’s car and she gets twelve chances at love, much like the movie that preceded this, Call For Love, although the main guy in that only 10 chances at love. Sucker. It’s also interesting to note that Zhang Junning tops the Sina poll, “Out of the twelve guys, who do you think is the best lover for Karena Lam?” showing just how skewed online polls are. He’s nowhere near as famous as the others. It’s probably all twelve year old girls (or twelve year olds at heart. Me!!) who are voting. The guys may be terrified of something like this, but the charismatic Karena Lam should be enough to appease them. 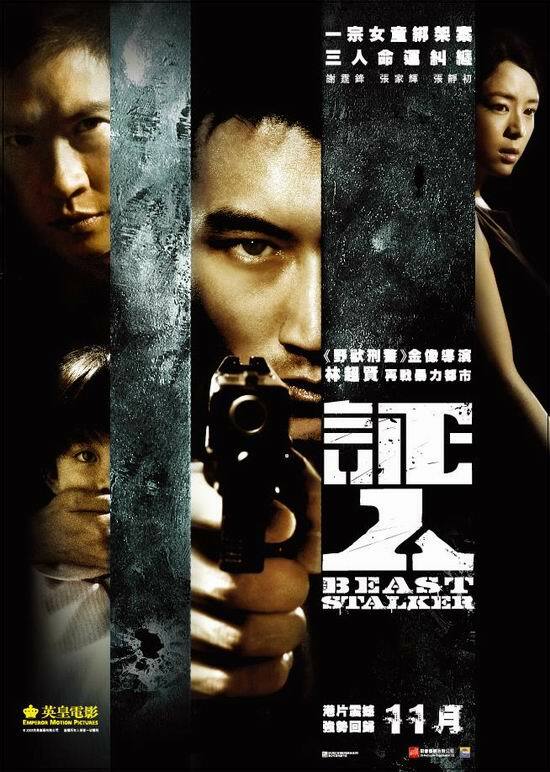 Appeal: There’s nothing extremely unique or exciting about this one, but it does have Nicholas Tse who is hot and Zhang Jinchu who is fastly rising as a leading lady in China. It’s also a cops and robbers action flick, which is what Hong Kong did best, and still does best out of all the Asian regions. Also, Dante Lam directed the first Asian movie that I watched by myself without my parents forcing me to watch it, Love on the Rocks, which started my interest in Asian entertainment in general. Not that the movie was actually good. Appeal: The poster gives it away…comedic actor Ge You who eclipses all others in size. The other cast members may help draw people in, but they’re just filler. Not even an ugly version of Fan Bingbing is enough to draw people to the theaters like Ge You is. He’s just too popular, and it’s been a while since he’s been in a comedy (during the Banquet, people kept expecting him to say something funny). Appeal: A movie following the same comedic tradition of the All’s Well Ends Well that starred Stephen Chow, Maggie Cheung, and Leslie Cheung, but only loosely related in plot (kind of like the Chinese Odyssey Movies). Only now it has Louis Koo. Downgrade of epic proportions, but Louis Koo does have the necessary self-deprecating charm for comedic roles and the looks. It also Sandra Ng, and Raymond Wong Bak-Ming who was in the first All’s Well Ends Well as one of the three brothers, the one not played by Stephen Chow or Leslie Cheung . While trying to find a poster for this…I discovered that he has a better body than many twenty year olds and probably a more pronounced six pack than Louis Koo. Wow. I’m not sure if that’s a selling point or TMI but it was certainly surprising. Congratulations Mr. Wong. No trailer available, but you can check out boyband Wind and Cloud’s MV for it. This movie had very, very little promotion up until now, with stills and a lackluster poster and trailer coming out only in recent weeks. But it’s Feng Xiaogang, China’s most popular director ever…the director who basically made the concept of New Years Holiday movie in China. He had been getting very dark lately with his films, starting from the satire Cellphone and ending with the Assembly which was a war drama. Those were mostly really good movies with the exception of The Banquet, but he got his fame through comedies, and he finally returns to that genre here. He teams up again with funnyman Ge You, his long time collaborator after not using him in The Assembly, so that’s probably the biggest reason people are going to check this out, although can they really take two Ge You movies at once? It also stars Shu Qi. Appeal: The first part has become the biggest Chinese box office draw in China, and is the highest grossing Asian film in Japan. 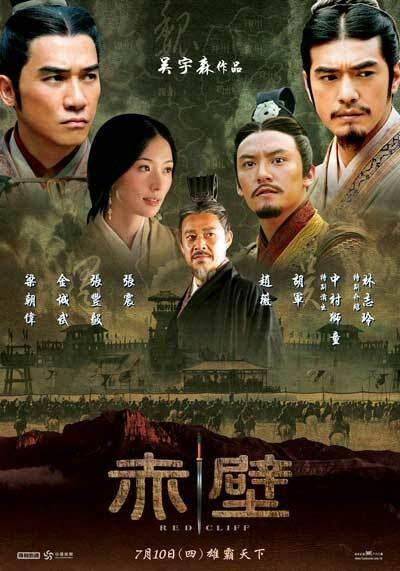 I think the appeal here should be obvious with its cast and its story, the Three Kingdoms drama which is well known not just in China (see Dynasty Warriors). Then again I never watched the first part. One of my favorite characters as a child was Zhou Yu, the clever general whose downfall was trying to be better than Zhu Geliang, and I imagined him as a tall, suave-looking young man, and frankly I think Tony Leung is going to kill that image for me. Tony Leung is a good actor, but Hong Kong, please stop using him. I can’t take it anymore. He’s in everything and there are much hotter, probably just as good actors out there! Find them! This entry was posted in Hong Kong, Mainland China, Movies, Taiwan and tagged All About Women, All's Well Ends Well 2009, Battle of Red Cliff Part 2, Beaststalker, Chen Kaige, Dante Lam, Desire of the Heart, Ding Sheng, Feng Xiaogang, Fit Love, Ge You, If you Are the One, Ip Man, John Woo, Ma Liwen, Mei Lan Fang, Not All Women Are Bad, Tsui Hark, Underdog Knight, Upcoming films, Vincent Fok, Wilson Yip, Witness, Zhang Jianya by cfensi. Bookmark the permalink. 2. The Confirmation of Identity portion. I really don’t have a Twitter, Tumblr, blog, or anything else. I really used to just lurk online until recently when I started commenting on here. Actually, you’d probably be a great candidate, despite those three points. 1. Not all of our writers are super-good at reading in Chinese. It’s more important that you have good English skills. Also, writing for Cfensi may help improve your Chinese reading skills (it definitely did for me :D). 2. You’ve been such an active commenter lately that we might not require this of you, since you’re obviously a real person and passionate about Chinese entertainment. 3. Don’t worry, not all of our writers can make this deadline either. We just don’t want people making one-time posts and then disappearing. Hmmm…. Why not then I guess. I do have some time now. Do I just send the e-mail according to here? Is there anything else I’d need to do? Maybe I’ll write my first article as the “sample article” and then just post it afterwards. I’ll be busy later today so it might not come in immediately. Had more time than I thought so I wrote something up and sent the e-mail. Let me know if there’s anything else. Ooh, I really want to see Women Are Not All Bad!! I don’t watch alot of mainland movies because I don’t really hear much about them. So it’s cool to read posts like this, thanks! Thanks, although I’m not sure how they knew about my blog. Must have been all the political anti-Jane McCartney posts. :D Now I’m just trying to remember if during all those years of reading Chinese news whether or not I liked Wall Street Journal. I don’t think they were too bad in terms of biases, considering they are mainly into finance and who doesn’t want a piece of the Chinese economic pie nowadays? Readers of Wall Street Journal aren’t really my target demographic however, so despite the bump in stats, I doubt I’ll retain any of the visitors. I’m really looking forward to Nanking! Nanking! as well, but it’s not the kind of movie that most people look forward to I guess. But Liu Ye and Gao Yuanyuan together is perfect if only they had more scenes together. I’ll definitely be writing a post about this when it gets nearer to its release date about the implications that this movie has, and all the other Nanjing Massacre related movies has. Don’t worry, it won’t be political though. I’m really surprised that Nanking! Nanking! isn’t on the list. Lu Chuan is a great director, and this movie is star-filled…but I suppose it’s not exactly a cheerful happy holiday movie. @William – When I say that the directors bombed with wuxia films I’m not really talking about the box office because naturally these films were some of the highest grossers due to the fact that they had an overseas market. Nor am I saying that they were all bad. I just think all of the wuxia were not up to par with what the directors had the capability to do. The Banquet was a perfect example. Feng Xiaogang is great because of the humanity he is able to incorporate in his films. The fight scenes weren’t badly done and it wasn’t terrible, but there was none of that humanity in the film. I admit, Hero was great. If Zhang Yimou didn’t follow that movie with HoFD and Curse of the Golden Flower then I’d think twice about saying directors fell into the trap of trying wuxia. But HoFD was also empty, empty of whatever it is that always makes me keep watching a Zhang Yimou film…still that humanity I think. Golden Flower was better but there really wasn’t much substance. In fact the same goes for Crouching Tiger Hidden Dragon. It was a novelty to America but it seemed kind of shallow upon subsequent viewings and I stick to the opinion that somehow, Ang Lee’s Chinese historical pics seem faker than his American historical pic and I don’t know why. Oh, and don’t forget Tsui Hark’s Seven Swords. I’m hoping The Underdog Knight will be great, but I think while it had warm reviews at Pusan where it screened, there wasn’t a whole lot of commotion about it so my hopes aren’t that high. I have very little faith in Chinese censors, but Quantum of Solace was completely uncensored so that’s pretty awesome. I think if you look in general at the last 10 years, they’ve obviously improved, but it’s so painstakingly slow and I’m really expecting them to pull some crap again any day now. They do seem to like encouraging new directing talent. @windowwatcher, I can tell you where to download them, but not here. But you can probably see most of them on crunchyroll anyway. @coolflix – I’m not sure what you mean about people losing money due to piracy. It’s not like America where people always had the money, but now have found a way to opt out of paying for what they see. China never had the money…only in the past decade has there grown to be a sizable market in China, and Hong Kong films has only increased their intake due to China. There may be piracy, but the middle class in China has grown to a very sizable amount that will go to the movies, and will splurge on things they like. Whether the fact that Hk movies are actually benefiting from a larger target market is a whole other issue. I also don’t think money is an issue in quality of filming urban life…I’ve seen lovely shots of smaller cities on my TV all the time as ads etc. I think it’s more due to the fact that the more established filmmakers probably grew up in the country, like much of their generation. Zhang Yimou is one of them…you can see his love for the country. In contrast HK directors have grew up in HK and have seen HK’s high-rises filmed for decades. If you want to try a more contemporary Chinese director who specializes in the city is Zhang Yibai…his are always shot in one of the bigger cities, first Beijing in Spring Subway, then Shanghai in The Longest Night in Shanghai, and most recently the city he grew up in Chongqing, in Lost and Indulgence. I’m guessing that as the experiences of Chinese directors change from a impoverished rural background to a more affluent urbanized background, the movies will as well, but you’re right, they still need a lot of work. Legally would be preferable. You can pay to see them in a theatre or, failing that (which is likely, depending on your location), you can buy them on VCD or DVD when they’re released via any of a dozen reputable and affordable online retailers or better yet, in your nearest Chinatown (if you can find a legit retailer there these days–they do exist!). That way, the industry can produce more (and preferably better) movies. This industry doesn’t pay it’s talent the way Hollywood does, and piracy is the main reason so many of these films a) look visually bland (the mainland cities aren’t half as interesting to look at as Hong Kong) and b) look like they were shot on high-end video rather than actual film (or even true HD) and c) don’t make much money at the box-office outside of the New Year season, and even that’s not always a guarantee. The “upside” of rampant piracy is, sadly, that more people will see these films than will see the average Hollywood picture, but sadly most won’t pay a dime to do it. Mind you, Chinese pictures (as in Mainland Chinese pictures) have a LONG way to go before they approach the level of gonzo artistry and populist appeal that Hong Kong films have enjoyed for decades, but neither industry deserves to take the hit they’ve taken, Hong Kong in terms of box-office, and China in terms of bland-looking contempo movies and overstuffed period pictures. so where do you watch these movies??? Legally or more likely illegally? I’m seriously asking cuz I dunno. Of this list I’m looking forward to Red Cliff (Part II) – Takeshi Kaneshiro = <3 of immense proportions. All About Women and maybe Fit Lover. If I could stand listening to Peking Opera, I would add Mei Lan Fang to that list, but…no. Ip Man: I’ve liked all the Donnie Yen/Wilson Yip collabos so far except Dragon Tiger Gate. with Donnie Yen playing a major part in the making of the film… the action will be mindblowing. I am going to go ahead and predict that Ip Man wins Best Action Choreography at the Hong Kong Film Awards this year. Plus, I enjoyed Fearless quite a bit so another biopic of another martial arts master wouldnt hurt. Donnie Yen is the MAN as well! Mei Lanfang – The trailer just looks quality. 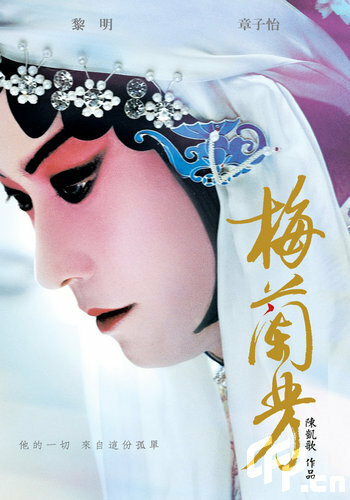 once again, its full of some very good Chinese actors and its about Beijing Opera. Honestly, im not a big fan of Beijing opera but Farewell my Concubine was great. This is of the same thread. Plus, its not The Promise…which IMO wasnt as bad as other people say it was but it wasnt great either. as for the “most directors bombed big when trying to tackle wuxia epics”, which ones are you referring to? Hero did great and won plenty of awards. The same goes for Crouching Tiger Hidden Dragon. Curse of the Golden Flower made plenty of money as well in China and got screwed out of best costume design at the Oscars because it wasnt a Western film. Warlords was also very solid and leads all films in the Golden Horse awards with most nominations. Which ones are you referring to? Im guessing The Banquet and The Promise. Women are not all bad – just judging by some of the promo art and stuff, the design and cinematography looked great. It looked like quality stuff. the actual subject matter isnt really my thing but I would like to see Tsui Hark make an actual good movie since he hasnt done that in years. If not this then hopefully the Judge Dee film he is doing with Andy Lau will be good. Underdog Knight – Now this looks good. Liu Ye and Anthony Wong are great and im just so amazed that this came out of Mainland China. Im actually a bit surprised it managed to pass the censors in China. Hopefully, they will loosen up so more stuff like this can come out. Looks violent, quirky, and just crazy. Cant wait for this one! Feng Xiaogangs new film will probably do great at the BO but not being a fan of comedies, it just didnt really attract my attention…. Assembly was awesome though. I’ll be waiting for his next “Assembly-esque” film. What a question! I don’t know where to begin. I’m not fond of Chinese arthouse flicks either although my favorite Chinese film is one. This year I think I enjoyed the most the Equation of Love and Death/ Connected this year and those were suspense/action films. Feng Xiaogang is a director who always does mainstream stuff and I’ve always liked his movies. His films are always blockbusters in China. Actually around Lunar New Year time there are a lot of fun movies without any messages at all. I really want to watch Fit Lover, but I don’t really think it’ll be good. It should be fun though. I think Desire of the Heart and Not All Women Are Bad seem higher quality, with better directors and have a decent shot at being good. Not All Women Are Bad looks like it could be great it Tsui Hark doesn’t manage to ruin it somehow.